Yamaha’s engineering ideal values the connection between rider and machine. In re-examining that relationship, the idea of a 'living motorcycle' was proposed. That would inevitably entail making it able to stand, move, and somehow communicate with the rider on its own. This was the starting point of the project. MOTOROID employs a dual-lens camera to recognise and sense its owner's biometrics, gestures, movements, and more, thus enabling it to interact with the owner. Together with the AI program, the camera serves multiple roles like data feedback for controlling the machine. Facial recognition means MOTOROID responds only to the owner's commands. This may eventually lead to keys becoming obsolete, or even rider aids like sensing if the owner is in the right physical state for riding. Furthermore, haptic human-machine interface (HMI), or touch-interactive surfaces, on the front and rear are included as a starting point for providing new conduit for sensory—not visual—communication between the rider and machine. A rider’s interaction and partnership with a motorcycle typically begin once the rider gets on. With MOTOROID, this starts even earlier with simple ride-by-wire controls and haptic interfaces that enhance the rider’s physical connection to the machine. Once settled into position on the bike, the machine wraps itself around the rider. Instead of throttle and brake levers, intuitive handlebar button controls provide a simpler riding experience for inexperienced riders. The principal idea is to have the machine support the user, who is made to feel in control. 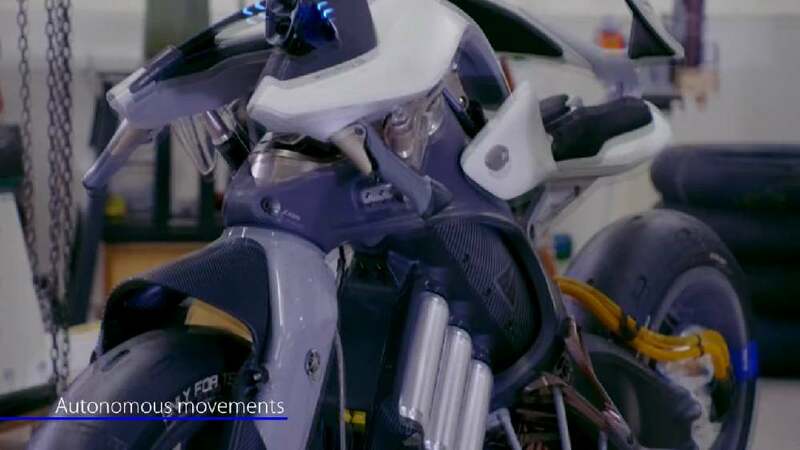 MOTOROID is capable of standing up, setting down and moving at slow speeds—all autonomously and unassisted. Maintaining balance and manoeuvring a motorcycle at very low speeds is often challenging to master, but assistance from Active Mass Center Control System (AMCES)—an auto-balance control system—could significantly reduce this hurdle. Technology based on MOTOROID may in the future reduce accidents while increasing fun. Together with its zero-emission, all-electric power plant, MOTOROID inspires a vision of future mobility that takes vehicles beyond being simple 'tools', and an affinity between motorcyclists and machines like never before.